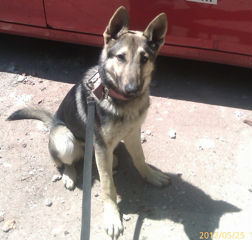 Hello my name is Tia Friend-Johnson and this is my 6 month old GSD Sheba. I first met with Sheba when she was five months old. I had the pleasure of training and eventually becoming her caretaker and owner. Sheba was a great dog and it was love at first sight. Sheba had a short lived life. She came to me because her previous owner decided to keep her in a crate for the first four months of her life. When her breeders found out about the poor treatment she was receiving,they took her back and gave her to my uncle. I began to work with Sheba and she was an awesome gal. We worked and loved each other and she was my best friend. My children and husband loved her and it seemed like we had her all her life. My uncle saw the love I had for Sheba and the bond we had and he decided to let me have her. Unfortunately in the summer of 2012 , Sheba succumbed to an intentional poisoning by uncle's landlord who did not like dogs. I was and still am heartbroken. Sheba had a short life and a hard life, but I learned a lot from her and I am so blessed to have been able to share some great times with her. The breeders were so sad to hear about her untimely death, that they allowed me first choice in an upcoming litter! So now I have Sheba's brother! I get to see Sheba in him. I just wanted to share a picture of her because she was totally amazing and beautiful. Thank you for allowing me to share my love for the amazing Sheba. give him,the man that killed sheba,the same. now I know you can't do that but I wish we could. I am so sorry that you lost sheba like that. I am so sorry to hear about you beloved Sheba, what a beautiful female! I know that ache in your heart too well. Sheba and you were meant to be together and you both had that unconditional Love. I am heart sicken that a person could be so cruel to murder a dog just because. There should justice for Sheba. Have anyone went to the police to file charges on the landlord? Cruelty to animals is against the law, he should be arrested and prosecuted. On a good note you have Sheba's brother that's great! German Shepherds are amazing as you know from Sheba. They totally Love and Protect their owners. Mia, our girl is 3 and she is something else! Next time post your boy we would love to see him. Take care.